Recorded in Los Angeles, California, October 1964. 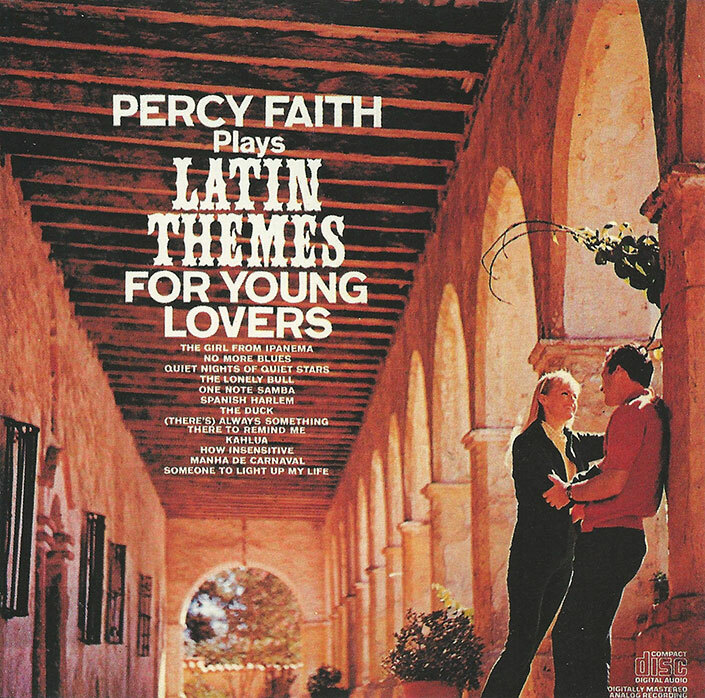 Percy Faith is no newcomer to the field of Latin music. His albums of Mexican, Brazilian and Cuban music have delighted aficionados and non-aficionados alike for many years now. It is with great pleasure that we present Maestro Faith’s latest album of Latin music, Latin Themes for Young Lovers. The songs chosen for this album are the very pick of the new crop of Latin music that has been sweeping America. The warm subtleties of the bossa nova are captured deliciously in One Note Samba, Quiet Nights of Quiet Stars and The Girl From Ipanema. Echoes of the pomp and pathos of the plaza de toros are exquisitely relived in The Lonely Bull. Some of the excitement and color of our own native Latin colony is caught in Percy Faith’s eloquent rendition of Spanish Harlem. Mix yourself a Margarita, adjust your tweeters and castanets, and without giving a thought to whether you can drink the water or not, you will be completely captivated by a world of Latin Themes for Young Lovers.